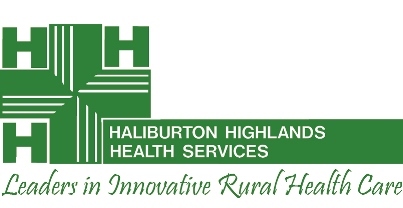 Reporting to the Board of Directors and working in partnership with the CEO, the Chief of Staff supports high-quality medical care and professional leadership at Haliburton Highlands Health Services (HHHS). This part time leader will work collaboratively with the HHHS Medical Advisory Committee and Executive Leadership team as well as the Haliburton Highlands Family Health Organization and other regional health service partners to help HHHS meet its strategic objectives and to support the medical team at HHHS to achieve its goals. Emphasis will be placed on candidates with experience in health care planning, administration and leadership, as well as experience working in rural environments. Candidates must hold active membership in good standing with the College of Physicians and Surgeons of Ontario. As innovative leaders in rural health care delivery, HHHS offers a broad spectrum of services with the goal of achieving improved local access to health services and quality of care for patients, residents and clients. As a rural health hub, HHHS promotes wellness and provides high quality health services across the continuum including Primary Care, Hospital Care (Acute In-patient and Emergency Care), Long-term Care, Palliative and End-of-Life Care and Mental Health and Addictions services, as well as an array of community programs. New investments in community programs, including a Geriatric Assessment and Intervention Network (GAIN) Team, a Palliative Care Community Team, Assisted Living Services for High-Risk Seniors and a Community Physiotherapy Clinic are all focused on supporting the residents of the Haliburton Highlands to stay healthy in their homes for as long as possible. HHHS is a teaching site, and works collaboratively with the Haliburton Highlands Family Health Team to support a full rotation of residents from the University of Toronto, Queen’s University and others. To learn more about HHHS please visit our website at www.hhhs.ca.